New River Gorge canopy tour at ACE Adventure Resort. 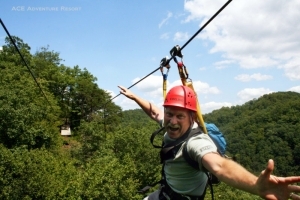 Zip lines and canopy tours in West Virginia provide explorers an innovative way to explore the Appalachian forest. Some canopy networks focus chiefly on the natural wonders of the canopy and feature high-speed zip-lines as part of the adventure. Others focus chiefly on the zip-line as a high-adventure amusement. Most zip-line and canopy-tour venues also offer team-building venues and obstacle courses.